No, dry cat food does not clean a cat’s teeth despite what the pet food manufacturers claim. When humans eat dried food we don’t claim that it cleans our teeth. Why should it be any different for cats? Dentists never recommend it. The pet food manufacturers have in fact changed the size of the pellets of dry cat food when the products are produced to ostensibly clean a cat’s teeth. If the pellets are larger they are more likely to do what it states on the packet but they don’t really work. When the pellets are very small cats even swallow them whole so there is no possibility of them cleaning teeth. The concept is that the abrasive effect of the dry cat food cleans teeth. 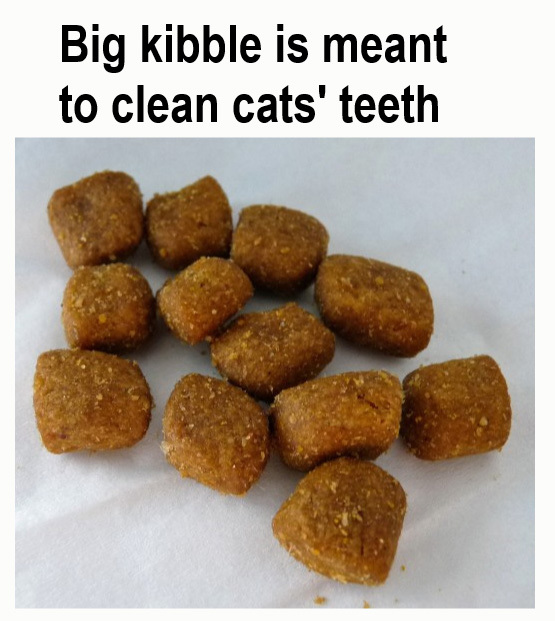 At a cursory glance it sound plausible and appealing to cat owners because cleaning a cat’s teeth with a toothbrush is all but impossible and very few cat owners try it, never mind do it successfully. Also, so-called teeth cleaning dry cat foods have been around for a long time and veterinarians continue to see huge numbers of patients with serious dental and gum disease. This surely must be strong evidence that dry cat food does not clean a cat’s teeth. In fact veterinarians report that many of the more serious dental conditions such as gum-line cavities occur in cats who are fed dry cat food. The truth of the matter is that when dry kibble is inside the cat’s mouth it becomes a sticky paste because it is mixed with saliva. This ‘paste’ can adhere to the teeth and gums to a greater extent than wet cat food. In addition, the processed carbohydrates and sugar in dry cat food paste (in the mouth) supports bacterial growth. Further, there is a very acidic substance coated onto dry cat food which makes it palatable to cats but the “oral environment” can become more acidic than normal which can damage the enamel which in turn can cause gumline cavities i.e. resorptive lesions. Some veterinarians might argue that dry cat foods promote plaque and tartar formation with accompanying gum disease and enamel erosion. It is difficult to believe anything that the pet food manufacturers claim on the packet if truth be told. 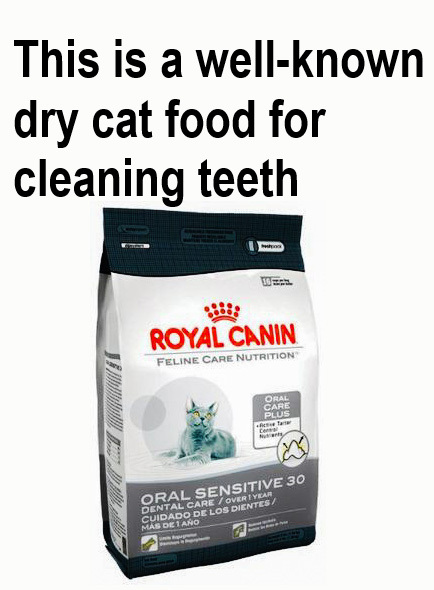 Despite what I have stated on this page, I am convinced that there are millions of cat owners who buy dry cat food which is claimed to clean teeth because they know that it is very difficult to maintain oral health in a domestic cat and cat owners look for any means possible to overcome that difficulty. This entry was posted in dry cat food and tagged cat teeth, dental care in cats, dry cat food, gum disease, mouth disease, oral health by Michael Broad. Bookmark the permalink. Interesting thoughts on the topic. They are a bit extreme perhaps but that is my nature! I don’t believe in the stuff. The product may be better than say small pellets but overall I don’t think it works as stated. Most cats don’t chew the dry food. So it has no impact positive or negative on the teeth. I’m sure someone has a cat that chews 20 times before swallowing mine don’t they will crunch some of the treats. This was per a discussion with a cat vet who did the oral surgery on Mercy’s mouth so she could have a normal life. Per vet recommendations she suggested soft food for 2 weeks. Mercy wouldn’t eat and that is where the discussion over kibble originated. Thanks ME. Yes I wrote about pellet size a way back. And they do swallow the stuff sometimes. This why so called dental care dry cat food is large pellets. Which means my cats wouldn’t touch it even if it did work. There was a cat treat we got from our vet that had cleaning enzymes in it. I haven’t seen them in the store for a while.